Greene County is a rising center for service industries as well as a prime location for retail and light industrial development. Interested in starting a business in Greene County? Start with the 5 Steps to Starting Your Own Business guide. Looking to start or relocate a business to Greene County? Search and browse the available buildings and sites . For more information and assistance with starting a business in Greene County, contact the Department of Economic Development & Tourism. With its diversity of industry, positive business climate and incredible quality of life, Greene County has a strong foundation for continued success. Search through our guides for local and state resources to make a smooth transition into business ownership. Greene County, Virginia is a fast growing gateway between dynamic Northern Virginia and Charlottesville, a Money Magazine "100 best places to live." Centered at the crossroads between two major highways, U.S. 29 and U.S. 33, Greene County is only 100 miles southwest of Washington, DC, 20 miles north of downtown Charlottesville and 78 miles northwest of Virginia's capital city, Richmond. 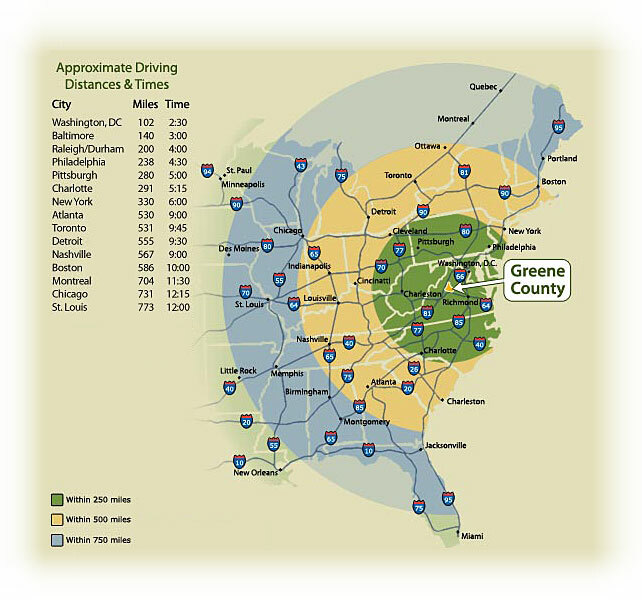 Greene is also close to interstates 64 and 81, and is only four miles from the Charlottesville-Albemarle Airport. The Greene County Economic Development promotes Greene County as a rising center for commercial and light industrial development. Its central location also makes it a convenient tourist hub, providing a relaxing setting, picturesque mountain views, and a temperate climate with welcoming inns, select wineries, and gracious dining.